Oh, big truck. Why do you go so slow? Ten miles under the speed limit the last twenty miles. I guess I should pass you. Well, maybe in a little while. I'll give you five more miles. No more. 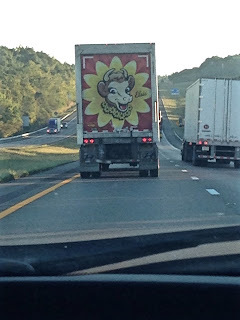 The truck driver is not in a hurry. He's probably a conservationist like me. There. I'm in the left lane. Oh dear—now you’re speeding up. Now you’ve cut me off. You must be having a bad day. I hope no one’s hurt. And she sounds concerned about us. Oh, look! A Pileated Woodpecker! I wonder which one I should be in. Does pushing the horn relieve stress for you? Elsie the Cow sticking out of a daisy. They must be doing important things. Uh oh. Must be danger ahead. Nope. He turns off at exit. His signal must be broken. Seven hundred miles to go. Will we make it today? That Conway double-truck weaving wildly. Pickup truck passing on the right shoulder. Like a plate of spaghetti. That's why we're still here. Should I read them all? What could that stand for? Puzzling that out distracts me. That makes the wheels turn. I like how complicated it is. And all I have to do is drive. And we're back in Tennessee. What a big, beautiful country. To explore it on foot. Grant was a better human being. Until I remember his painful death. I wish the Google Map Lady could speak Jane Austen. If I missed an exit, she could say, "I am most seriously displeased." And she'd remind me to wear my bonnet. Hundreds circling over the highway. I wonder if they know something. To get where we're going. But the getting there is fun, too. Pointing his middle finger at the sky. Yes! That is a pretty cloud. I give him a thumbs up. This fall is shaping up to be one of the best I can remember, as far as bird migration through Duluth goes. I’m not surprised—it was a great year for breeding birds, so the raw numbers of birds in our neck of the northern hemisphere are probably as much as we could have hoped for. We had a decent May, with no horrible deep freezes or heavy snow events to kill migrating warblers. Robins started nesting on the early side. I spent a lot of time in my backyard during the somewhat time-intensive weeks of housebreaking my new puppy Pip, and there were more singing robins in the neighborhood than we’ve had in decades. At times in early morning and evening I could pick out five different males singing simultaneously. Robins re-nest when conditions are good, and the pair that nested nearest my yard in April nested in my yard in June, and nested a third time in my neighbor’s yard—the three in that brood stayed in the nest until their tails were almost entirely grown, fledging on July 31. Hairy and Downy Woodpeckers both nested in my yard. I had one male Red-bellied Woodpecker visiting my feeders throughout winter and every spring day until May 23; just on Labor Day weekend I heard and got a quick glimpse of a red-belly, and then saw three—at least two were fledglings! 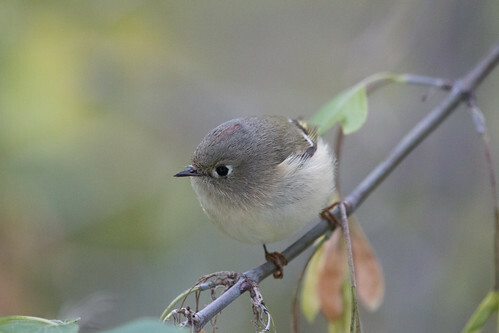 Every single day this June I heard a Ruby-crowned Kinglet singing. He had to be on territory, and to stick with it that long, he had to have attracted a mate. There are some old spruce trees in the alley kitty corner from me. I never did find the nest—it can be way high up, and is deeply nestled into thick branches—but I did finally spot one kinglet carrying food, which is considered confirmation of nesting. No one’s ever reported kinglets nesting in the city before. Chickadees had a great year, too. 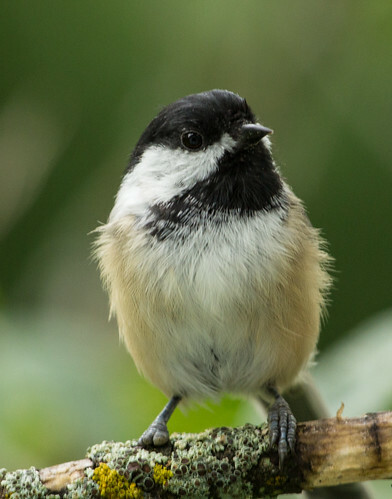 Most joyful for me was learning where my chickadee—the one who’d had the deformed beak and is missing all the front toes on one food—was nesting, at my friend Jeanne Tonkin’s house, kitty corner from mine. It was sublimely joyful witnessing that particular bird feeding babies in the little tree cavity on June 10. If I’d known where the nest was while the babies were still tiny, I could have held a dentist’s mirror in and counted them, but now the babies’ eyes were open and they were well feathered—coming too close could have caused them to fledge prematurely. Chickadees sometimes fledge at as early as 12 days, when their tails are tiny stubs, if something frightens them out of the nest or the parents are struggling to find enough food and one or two babies leap out of the nest to follow the parents out of desperation—then the other chicks must follow or they will likely end up starving, with the more demanding chicks getting all the food. The very next morning after I first saw the nest, I went back to discover that some of the brood had already fledged. I got to witness the last three leave the nest one by one. They had almost fully grown tails already, which means they’d been in the nest close to the maximum 16 days. The brood’s survival rate is higher the longer they can all stay together developing in the nest. Calculating backward, knowing it must have been 15 or 16 days since they’d hatched, after 12 to 13 days of incubation, and after at least 5 days of egg laying (and quite likely more—I only saw 5 fledglings, but most broods have 6–9 young), I knew that the first egg had been laid, at the very latest, around May 10, and quite likely several days earlier. The fact that the weather was mild enough that early, and we didn’t get any bad snowstorms after that, were critical factors in the survival of this nest. And the early fledging meant that these babies had a whole summer to gain skills before separating from their parents and joining fall flocks. With such great nesting success this year, it’s small wonder that now we’re seeing so many migrating songbirds. In her long-term study of Song Sparrows, Margaret Morse Nice found that the amount of precipitation each summer is directly related to the number of Song Sparrow young produced, because rainfall is directly related to how many insects are about, and insects are the main food most songbirds feed their young. We’ve had plenty of rain this year, so well spaced that for the first time in decades my yard has a good supply of slugs. Not that I particularly enjoy them, but their success was due to the same factors that kept baby bird numbers high. I have a regular birdbath in my yard, and in August got one with a tiny recirculating waterfall. Early in the month, I started seeing families of Nashville and Blackburnian warblers coming in to the birdbaths, the recently fledged young still following and occasionally being fed by their parents. Warblers are always on the move by early August, but seeing whole families early in the month was confirmation that they’d had a good year. So it’s not at all surprising that we’re seeing plenty of flycatchers, vireos, warblers, and tanagers visiting people’s birdbaths and fruit trees now. My friend Tom, who lives in Madison, has a female Ruby-throated Hummingbird whose first nestling just fledged on September 8. This is almost certainly a second or third nest, and it’s late enough that she probably successfully reared at least one brood already. The number of hummingbirds in my own yard has been astonishing right now. They’re doing a little squabbling at the feeders, but most of the action has been up in the trees, where I can watch them zipping about erratically, chasing tiny insects or, I think, sipping tiny droplets of sap oozing from branches. I haven’t seen an adult male since August 30, but there are so many young birds and adult females that I feel pretty confident that they had good breeding success, too. If I were only looking at my feeders, though, I’d suspect their numbers were down. Natural food is too abundant. 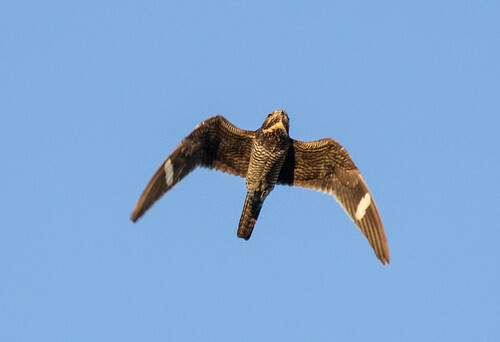 This year’s nighthawk migration was cause for celebration. Back in the 80s we often had nights of over a thousand birds being counted here and there along the shore and at points south of here, but none of those counts were systematic. On August 26, 1990, Mike Hendrickson counted over 43,000 in 2 ½ hours up the shore from Duluth. He started counting because he could see what a phenomenal night it was. But that kind of effort wasn’t a daily thing, so there was no way of quantifying the migration over entire seasons, and since then numbers have definitely dwindled. Jerry Niemi from the NRRI has been organizing late afternoon/early evening counts from East Superior Street in Duluth for several years—there have been many nights that numbered in the hundreds or thousands, but no year’s count has totaled what Mike Hendrickson counted in just 2 ½ hours since these more systematic counts started. But this year the coordinated counts between Hawk Ridge and the nighthawk research are producing large numbers of birds. On Saturday, August 29, my neighbor Jeanne Tonkin called to tell me nighthawks were flying over, so I stood on the corner with her and in one hour counted 2,165 nighthawks. That same day they tallied 13,723 nighthawks from Hawk Ridge. It was easy to assume that was this year’s “big day,” but then on September 1, they more than doubled that, counting 28,054 at the Ridge—the third highest count in Minnesota ever! And that flight was counted in the morning, not late afternoon when most nighthawk flights occur. That hardly means that the nighthawk population in North America doubled or tripled or quadrupled its actual numbers in a single year. I’m sure production was excellent, but that was combined with favorable weather conditions to push birds from central and maybe even western Canada and the Plains States toward Lake Superior so we could see them. Even in that context, it was heartening and wonderful to see. The other factor involved in this year’s unprecedented numbers has nothing to do with birds at all. Karl Bardon, the head hawk counter at Hawk Ridge, is the first counter we’ve had who has been totally committed to counting every migrant over the Ridge, and his skill at identifying even distant tiny specks down to species is astonishing. Back in the 80s and early 90s, a handful of us were counting non-raptors from the Lakewood Pumping Station. We did a really good job for that era, but both optics and birder knowledge and skills have improved since then, and Karl and the team he works with are at the top of this era’s world class birders who can tease out identities of way more birds than I could 20 years ago. On August 29, from Hawk Ridge and the East Superior Street vantage point, where Steve Kolbe has been conducting this year’s nighthawk counts, the amassed data (which takes the biggest number per hour from whichever station it happened, not adding the numbers to avoid double counting the same birds) he and his team counted 91,667 non-raptors, including 12,842 Cedar Waxwings, 33,758 warblers of 19 species, 1,085 Blue Jays, 198 Rose-breasted Grosbeaks, and 21 Scarlet Tanagers. On many days the number of non-raptors at the Ridge has exceeded a thousand, sometimes many times that. So what do all these numbers mean? Some people on Facebook have been fretting that our early, large migration is a sign of an impending severe winter, but that’s ridiculous. We’ve clearly had a great summer for baby bird production, with enough first nests doing well that many birds were able to head out early. This is great news for them, allowing them to capitalize on the abundant food right now. And favorable weather is pushing a large percentage of the birds out there our way to be seen, enjoyed, and counted. Our hawk migration is also going well, with the first days over 1,000 just starting, and the huge push is yet to come. If you want to see what the fuss is all about, come on up to Hawk Ridge. You’ll be glad you did. I get through most of my days like pretty much everybody, thinking about and doing what needs to be done, accomplishing what I can in dribs and drabs, procrastinating now and then, having sudden bursts of creativity and energy, having some fun and dealing with some frustrations, and hardly thinking about the big questions of life. But perhaps because I started out the year with a heart attack, I’ve been having more days when I appreciate how happy I am to be alive right now, in this lovely place on this lovely planet; how grateful I am for my family and friends and my little dog Pip; and how profoundly lucky I am. I'm the third person in my family to have had a heart attack, but only the first to survive one. That’s profoundly unfair. For that matter, all my good fortune is not fair, nor are the bad things that happen to me. Fairness is a human construct, while the nature of life on this planet is far too random for fairness to have any meaning. It's up to us humans, who so cherish the ideal of fairness, to make life fairer for those humans and creatures less fortunate than we, in the way that Pope Francis is asking every European parish to take in a refugee family right now. It's sad that so many Americans consider justice to be limited to punishing wrongdoers, while casting a blind eye to the bigger parts of the equation: rewarding the finest among us and helping those in need. As human beings, our first priority is obviously other humans, but the creatures with whom we share this planet are also our responsibility. 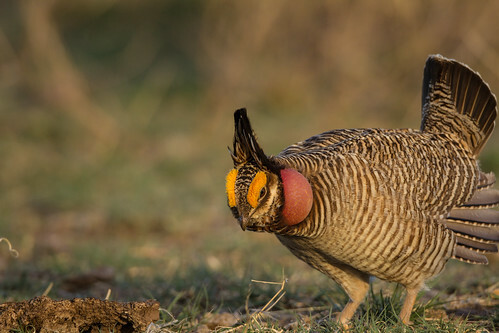 Just last week, a Texas judge overturned the US Fish and Wildlife Service's decision to list the Lesser Prairie-Chicken as Threatened, denying this critically endangered species any protection under the Endangered Species Act. 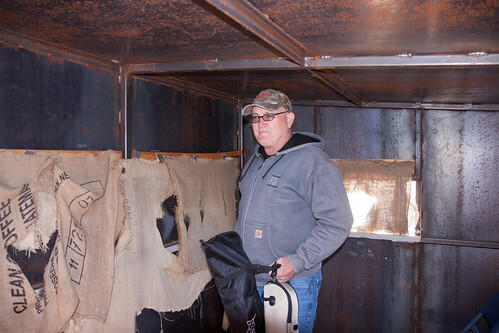 District Judge Robert Junell accepted whole cloth the arguments by the Permian Basin Petroleum Association, which had stated that protecting the prairie-chicken would impede operations and cost companies hundreds of millions of dollars in oil and gas development in one of the country's most prolific basins, the Permian Basin in the Texas Panhandle and eastern New Mexico. In our system, justice has come to mean the rich get richer even as entire species disappear. Legal justice can be completely removed from the concept of fairness. King Lear on the heath, his poor old body being pelted by the storm after his heart had been pierced by the unfairness of two of his daughters' cruelty to him and his own cruelty to his third daughter, didn't whine about unfairness—he raged at it even as he took off his own cloak to comfort and warm someone in worse straits than he, Tom o' Bedlam. The unfairness he faced made him recognize the ways he should have imposed fairness himself when he had the riches and power to do so. Too little care of this! Take physic, pomp. In the final analysis, this may be the one way that we humans are different from animals. We have both the capacity to "shake the superflux" to those less fortunate than we and the concept of fairness that demands we do so. In a random universe, we who have the concept of fairness embedded in our very souls have the obligation to bestow mercy and kindness on those who deserve it—an obligation that is every bit as sacred and every bit as just as meting out punishment to wrongdoers. I guess the thought that stays with me after my heart attack is that to have a happy life, we need to recognize and savor what we have, whether we deserve more or less; to share our riches with others; and to protect those who need it in order to "show the heavens more just," exactly as Pope Francis asked European Catholics to do. My chickadee missing three toes--he raised at least 5 babies this year! And since my heart attack, I’ve had way more to savor than I’ve deserved. My neighborhood bustled with bird nesting activities all summer, including Ruby-crowned Kinglets, robins, and my favorite chickadee raising his chicks successfully. Now, since August, migration has been rich and beautiful to see and hear. I have a new birdbath with a tiny recirculating waterfall; it attracted several kinds of warblers and other little birds. I have a wonderful friend who gave me brand new binoculars through which to enjoy the spectacle. And I have new hearing aids that are allowing me to hear them with the vibrance I savored when I was in my 20s. I still can’t wrap my head around these riches. Pip helps me open my new binoculars! My puppy gives me endless moments of joy. Whether Pip is chasing lightning bugs like a bunny in a marijuana patch or cuddled up next to me on a long drive; whether she's taking a long birding hike in Port Wing, Wisconsin or sitting at my feet in the backyard waiting as I photograph a bird, she brings me endless happiness. She and I were out in the backyard on Saturday, when my yard was teeming with birds. I spotted a catbird in the dogwood in the back of the yard. It was behind some leaves in the shadows, and I waited for it to come out toward a patch of sunlight. The catbird had been eating berries but now was staring at something low and to my right. I didn’t want to break my own gaze or take my camera off it when it was so close to a perfect perch, so I didn't look to see what it was looking at—for all I knew, it could have been gazing off into space in a contemplative mood. But suddenly, quick as a flash, it darted out and alighted on Pip’s back—she’d been sitting next to me with her back to the dogwood. For a hilarious second, Pip’s ears flew straight up like the dog in My Little Rascals, but by the time she could turn her head around to see what was happening, the catbird had vanished back into the dogwood, leaving Pip with the funniest look of puzzlement I’ve ever seen and filling me with bliss just to have witnessed such a delightful thing. Pip looking for that catbird. When I'm inside at night, Pip snuggled against me, I can savor photos I've taken, wonderful past events making my present even brighter. 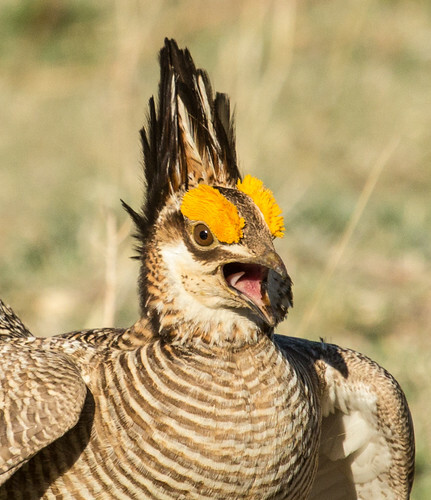 In 2014, I spent several hours at a Lesser Prairie-Chicken lek, in a photography blind, just a few feet from these glorious birds. The photographer with me had rented an 800-millimeter lens, so huge it looked like a bazooka, which he set up on a heavy-duty tripod. Whenever he used another lens, he let me hook up my own camera to the amazingly wonderful lens! When I look at these photos, I get to savor the beauty of this wondrous bird, get to remember the exceptional generosity of that kind photographer, and feel myself grow more committed to supporting every effort to save this splendid species that means nothing more than a minor speed bump to the oil and gas industries. One final paragraph of advice: do not burn yourselves out. Be as I am - a reluctant enthusiast....a part-time crusader, a half-hearted fanatic. Save the other half of yourselves and your lives for pleasure and adventure. It is not enough to fight for the land; it is even more important to enjoy it. While you can. While it’s still here. So get out there and hunt and fish and mess around with your friends, ramble out yonder and explore the forests, climb the mountains, bag the peaks, run the rivers, breathe deep of that yet sweet and lucid air, sit quietly for a while and contemplate the precious stillness, the lovely, mysterious, and awesome space. Enjoy yourselves, keep your brain in your head and your head firmly attached to the body, the body active and alive, and I promise you this much; I promise you this one sweet victory over our enemies, over those desk-bound men and women with their hearts in a safe deposit box, and their eyes hypnotized by desk calculators. I promise you this; You will outlive the bastards. Of course, Abbey's promise is as empty as "the best is yet to come"—he's dead and the forces demolishing our natural world are stronger than ever. But as Abraham Lincoln put it, "It is for us the living, rather, to be dedicated here to the unfinished work which they who fought here have thus far so nobly advanced." With what time we each are given, to the best of our abilities, we should honor the better angels of our nature by saving and savoring that which we love. I’m planning to go on one of Kim Eckert’s birding trips to California in January, and am saving up for a trip to see my most wanted bird on the planet, the Cuban Tody, so in my case the best may still be yet to come. It is lovely to have things to look forward to, but even lovelier being able to savor the here and now even as I focus on ways to protect it. And as long as birds are on the planet, and as long as I can still see or hear them with my lovable little dog beside me, I have more than my share of loveliness to savor. Book Review: Feeding Wild Birds in America: Culture, Commerce & Conservation by Paul J. Baicich, Margaret A. Barker, and Carrol L. Henderson, published by Texas A&M University Press, College Station, Texas, 2015. This spring, I was sent a copy of a new book about bird feeding, written by two authors I know personally and respect deeply—Minnesota’s own Carrol Henderson, who has directed our DNR’s Non-Game Wildlife Program from its inception and is the author of the most comprehensive book about bird feeding I’ve ever seen, Wild About Birds: The DNR Bird Feeding Guide; and Paul Baicich, one of the most respected conservationists of our time. The third author, Margaret Barker, was a coordinator for Project FeederWatch at the Cornell Lab of Ornithology before my time at the Lab as Science Editor, so I’ve never personally met her. All three authors have written multiple books and are well regarded by many. There are lots of books out about bird feeding, and Carrol Henderson’s Wild about Birds in particular is so excellent that my first thought was we don’t really need any more books about it. My second thought was that Wild about Birds is now 20 years old, and we do have more information about some issues than we did in 1995, perhaps most importantly regarding hummingbird feeding. And my third thought was that I knew this book was going to cover the history of bird feeding, about which Henderson and Baicich are genuine authorities. So I was excited when I learned about it. They did make several references to Thoreau and provided a wonderfully comprehensive history that explains how bird feeding evolved from such a quiet, simple little activity into what is now a multibillion-dollar industry, with wonderful discussions of such cool things as Field and Stream magazine focusing on backyard bird conservation. The historical information in the book is invaluable. I wish the authors had done as thorough a job with their coverage of some important commerce and conservation issues for the current millennium. The nature of any lucrative industry is to maximize profits and minimize expenses. With many products, consumers are savvy enough, and government regulations strong enough, that bad products are quickly driven off the market. In the wild bird industry, there is no governmental oversight whatsoever, and few consumers are aware of many issues involved in attracting backyard birds. 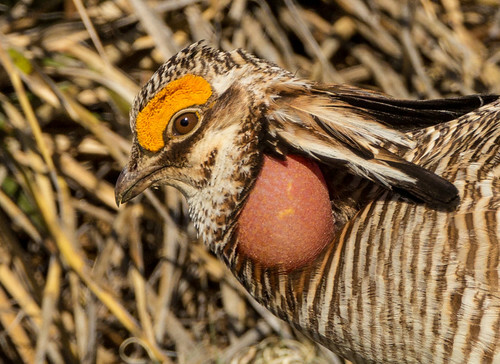 The industry is under no legal obligation to ensure in any way that the products they sell are good for birds--they're not even required to ensure that their products won't out-and-out harm them. The book's chapter, "Bird Feeding in the Twenty-First Century" says that in 2012, "the amount spent for bird feeders, birdbaths, and nest boxes had increased to $969.7 million" without one word about how crappy some of these products are. Metal bird houses ostensibly designed for wrens and chickadees, but which would cook or freeze eggs or nestlings if the birds actually used them, are sold because many consumers don't know any better and there is no one to develop "building codes" based on the kinds of safety regulations that keep houses and baby cribs safe. (I quit a job working for an optics company when they sold out to a corporation that was selling exactly this kind of dangerous bird houses.) A great many of these products are manufactured in China. Prices are kept down and profits up in part because of China's lax environmental regulations, and in part because the container ships that carry them here are fueled by cheap but highly toxic bunker fuel. No matter how you look at it, getting products from China is harming the air and water that wild birds depend on. Of course, the book isn't so much concerned with those kinds of products as they are with wild bird food, which took in $4 billion in 2012. Even as they tout that figure, the authors skip important issues about how that money is generated. Research conducted by Dr. Scott Henke of Texas A&M University Kingsville found that 17% of the birdseed samples tested in Texas contained relatively large amounts of the toxin. His research further suggests that feeding wild birds foods contaminated with aflatoxin can be harmful. The Institute doesn't question the accuracy of Henke's finding, but all their recommendations for dealing with the problem put the onus on the consumer: their aflatoxins information page includes a relatively lame "consider avoiding seed mixes containing corn and peanuts, as the Aspergillus fungi are most likely to grow on these food items," after obfuscating the issue by first listing eight other recommendations, including keeping cats indoors and making windows safe for birds! Those are important points to be sure, but utterly unrelated to aflatoxins. The institute does make good points about seed storage, but those are only useful if the seed isn't contaminated to begin with. And despite their awareness of the issue, the industry continues produce, package, and distribute corn and peanut products without testing them or guaranteeing to consumers that they are safe for birds. Feeding Wild Birds in America quotes the Wild Bird Feeding Institute a lot, but almost always favorably, and never once mentions this issue. The Red-bellied Woodpecker on the cover, feeding on an ear of corn, seems a clear endorsement of offering corn without mentioning its particular vulnerability to aflatoxins. Of course, most corn really is perfectly safe. But we can’t know how safe the corn we're buying is as long as corn isn't tested at all for wildlife feeding. I caution people to purchase peanuts in bulk from grocery stores and corn from livestock feed stores until the bird feeding industry starts testing products for aflatoxins. Since Wild about Birds came out in 1995, we've learned a lot about how harmful red food coloring is, even as red dyes are still used in commercial hummingbird nectar mixtures. The industry still keeps claiming that no studies conclusively prove that red dye causes cancer or death in hummers. The trick is, even if the corporations that sell the dyes and commercial nectars were willing to fund such studies, permits to conduct the laboratory work would be virtually impossible to obtain because that kind of research would necessarily kill hummingbirds, and so is prohibited by the Migratory Bird Treaty Act. Human food and drug testing isn't done on humans, either--it is lab studies on rats and mice that lead to guidelines about what is safe to consume. And based on this kind of research, we know darned well that red dyes absolutely do not belong in hummingbird nectar. But despite a long section about the popularity of hummingbird feeding, the book makes no mention of this important issue. When I was a licensed bird rehabber, I noticed that when someone brought me a hummingbird that had been feeding on sugar water with red dye, it took 36 hours or more for the dye to disappear from their droppings. Julie Zickefoose, a well-known bird rehabber as well as writer, has written about the same phenomenon, and done a lot of research into the issue. A 2001 study on laboratory mice by Tsuda in Japan published in Toxicological Sciences found that relatively low doses of Red #40, the world's most popular food coloring, caused pre-cancerous DNA damage in the colons of mice. Hummingbird bander David Patton tracked one banded, color-marked hummingbird to learn that that individual took about 10 grams of sugar water from one feeder each day, along with the other, natural food sources in his diet. Had that feeder been filled with a popular commercial hummingbird nectar mix, properly mixed with water according to the instructions, the tiny bird would have ingested more than 15 times the amount, for its size, that the World Health Organization recommends as a daily limit for humans. And the nectar taken from a single feeder would give the hummingbird 12 times the amount of red dye shown in that 2011 study to cause DNA damage in mice. Julie compiled all this information and has been doing her best to publicize the dangers of red dye in commercial hummingbird mixtures--dangers that are not offset by any good whatsoever. The index of Feeding Wild Birds lists her on three pages specifically regarding hummingbirds, but I can’t find anything mentioning her on those pages. Sheri Williamson is an acknowledged authority on hummingbirds; among other things, she bands them and is the author of A Field Guide to Hummingbirds of North America in the Peterson guide series. Sheri is quoted extensively regarding some great work she's done with the hummingbird feeding industry, but not at all about how hard she's tried to persuade that very industry to get rid of the red dyes in commercial hummingbird food. Any book touting both commerce and conservation in its title has some obligation to put the profits of the multibillion dollar industry they’re celebrating into some context, don't they? Another timely issue that might have been addressed in a brand new book about bird feeding is the work on late fall and winter hummingbirds, and the value but also the caveats of keeping feeders going for them. That is rapidly becoming part of the culture of bird feeding (the first word in the subtitle), but no mention was made, nor is Scott Weidensaul, a hummingbird bander who has led quite a bit of the public education regarding vagrants in the Eastern US in winter, even mentioned in the book. The book discusses Global Harvest Foods's acquisition of Scotts Miracle-Gro Company’s US wild bird food business in March 2014, I think to emphasize what a big business bird feeding has become. But as long as they were mentioning these specific giant corporations by name, shouldn't they have also mentioned that in 2012, Scotts was fined $12.5 million dollars after birdseed they sold was discovered to be laced with a pesticide to prevent insect damage—a pesticide specifically labeled as unsafe for birds? Someone within the corporation had noticed the labeling and warned that they needed to stop this, but was ignored—that was part of the reason the penalty was so stiff. They might also have mentioned the recall of the birdseed, and how poorly it was conducted by retailers so that a great deal of the toxic seed ended up being sold. Nowhere is the book can I find any mention the millions of Red-winged Blackbirds poisoned every year in western Minnesota and the Dakotas, with permitting from the US Department of Agriculture, to appease farmers growing sunflower seeds. The book does cover one negative about the Wild Bird Feeding Institute, mentioning that it fought against the Teaming with Wildlife effort of the 1990s that was trying to create a system comparable to the Pittman-Robertson Federal Aid in Wildlife Restoration Act of 1937. That act imposes an 11 percent excise tax on all firearms and ammunition, earmarked for game species conservation. The Teaming with Wildlife project, which was fought for by Paul Baicich--that's how I learned about him in the first place--was hoping for much less. They were asking for a similar fee on birding optics, birdseed, bird feeders, etc. that would never be allowed to exceed 5 percent--less than half of what Pittman-Robertson collects--to go for non-game wildlife protection. Unfortunately, the birding community was no more cooperative than the bird feeding industry, and without a united front by our own community, it was impossible to persuade a Congress that, at the time, was obsessed with the "no new taxes" mantra. Some people complained that binoculars are used for a lot more than birding, but guns and ammo are used for a lot more than hunting. In a real sense, muggers and terrorists contribute more to conservation than birders are obliged to. I was one of the conservationists sorely disappointed to see the Teaming with Wildlife effort fail. If you want to focus on the history of bird feeding through the 20th century, Feeding Wild Birds in America: Culture, Commerce & Conservation covers that beautifully. If you’re interested in a comprehensive book about how to feed birds, Carrol Henderson’s Wild about Birds is still the best we have, and all the earnings directly benefit the Minnesota Non-Game Wildlife Program. If you want to learn about the culture of bird feeding today, check out the many magazines focused on that, or blogs by people like Julie Zickefoose, and Sharon Stiteler (Birdchick). Go to Lanny Chambers's hummingbirds.net site to get up-to-date information about hummingbird feeding. I hate writing negative reviews about bird books—there are too many good books out there that get short shrift, so why focus on ones I didn't like? And it’s of course possible when I dislike a book that I’m missing some excellent quality that makes it much better than I realize. And I didn't dislike this book--it did a wonderful job of covering the history of bird feeding. If they'd titled it Feeding Wild Birds in America: a History, I'd have given it a glowing review. But when such an authoritative, respected group of people write a book focusing specifically on the commerce of the bird feeding industry, I expect it to be more than a corporate fluff piece. The only way we can force bird food producers, distributors, and retailers to guarantee their products are safe for birds will be for consumers and the government to press them--otherwise, the multibillion dollar industry holds all the cards. I know I'm too much of a socialist to be fair about some of the issues. These three authors aren't plagued by my Irish temper and my unwillingness to temper my words when bird lives are at stake. I am a devoted bird feeder myself, and know how valuable bird feeding is, for people's enjoyment and because it is the only connection millions of people have with the natural world nowadays. It should be equally valuable for birds. If this book had presented a balanced and clear-eyed look at the problems as well as the wonderful elements of bird feeding, it could have done a world of good in helping to alleviate those very problems by educating consumers and pressuring the industry both. Bill Thompson Jr. wrote that we've reached saturation in the genre of bird feeding books. I think we could have used one more book on the subject--one that thoroughly covers the issues involved with bird feeding in America--the culture, commerce, and conservation. Sadly, I'm still waiting.